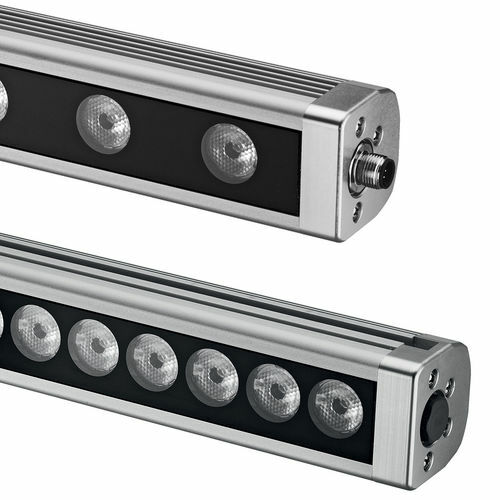 A powerful lighting bar, which can be widely used to illuminate facades and bridges. Thanks to its compact, sophisticated design, it integrates perfectly into any structure in which it is installed. It answers the most exacting requirements of washer and wall washer lighting, and by the accurate use of secondary optics it becomes a very versatile product that can easily be used in many situations. The elegance of the product means that it can be installed in full view, and the total absence of front screws makes it a pleasing object even when switched off. Body in anodized corrosion-resistant extruded aluminium. Flange in anodized corrosion-resistant aluminium with integrated seal. Extra-clear safety glass with a thickness of 6mm fitted flush with the fixture, ceramic-coated rear. Anti-condensation compensation valve. Adjustable from 0° to 135° with graduated bracket. Electric connection with screw connector. High power LED module on printed circuit board with metal base. Electronic components, dimmable with external dimmer. Highly efficient secondary lens.